When I talk about my wine business, I tend to say that "I am in a constant search for great wines". I am not necessarily looking for organic wines, but with the outcome of my quests a great wine often turns out to be an organic wine, or even a biodynamic wine. Another outcome, one which I used to mention to my audience quite regularly: most of the winemakers that I work with are young people − winemakers who decided to "do it their way", i.e. different from what the previous generation did. Most often heard: they bring down yields, start working organically, and try to intervene as least as possible during the process of vinification. This weekend I returned from the Loire valley, where we spent a week long tasting wines (the first two days at the Salon des Vins de Loire in Angers), and visiting winemakers. On this trip I was happy to receive a clear message: the age of the winemaker is not related to him or her being innovative, i.e. being interested in new ways of farming and winemaking. We visited three older winemakers (just a coincidence), all three very passionate about the new directions they had chosen. Three youthful spirits: Philippe Pichard (Chinon), Eddy Oosterlinck (Coteaux du Layon) and Evelyne de Jessey-Pontbriand (Savennières). It was inspiring − especially for someone who just turned 40, then the mind is open for these kind of messages. In this posting I briefly present Philippe Pichard − the rest follows later. Avoir l'amour du vin, c'est d'abord aimer sa vigne. The poet is Philippe Pichard, vigneron in Cravant-les-Coteaux, the best known village of the Chinon appellation (besides the small town of Chinon itself). These words might come across just romantic, but it is a simple truth that if you want to make a great wine, at least the grapes for the wine should be great. And although already in his fifties (I would guess...) Pichard's love for the vigne recently made him convert to the principles of biodynamic winemaking. A big step, showing his determination. 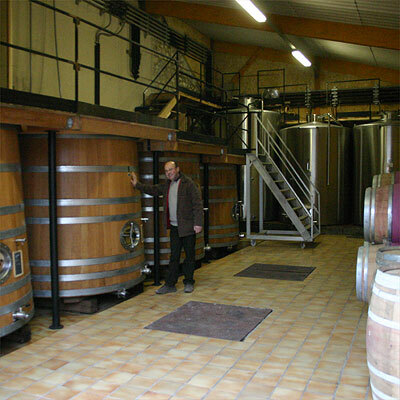 PHILIPPE PICHARD IN HIS CHAI WITH THE FERMENTATION VATS. But my interest in his wines started with tasting his wines, which I did in Angers at the Salon. Chinons can be lovely, but there are plenty of Chinons that aren't (they can be unripe, they can be hard, they can be rustic etc.). Pichard's Chinons are full of life, with vital fruit. His wines are supple and pure, with a pleasant texture and an attractive freshness. Wine as it is meant to be. Red Chinon is exclusively made from cabernet franc, and Pichard makes four different wines from this variety, from different soils. For this moment I brought to Amsterdam his basic Chinon, the fruity and straightforward Gravinières 2007. This wine comes from the gravelly plains close to the river Vienne, from vines ranging in age from 10 to 30 years. This is a fairly light, and easily digestible Chinon. It nicely combines the love-it-or-hate-it idiosyncrasies of the cabernet franc (e.g. the hint of school paint in the nose) with the ease and accessibility of a lunch wine. And I like the slight mineral touch it has. 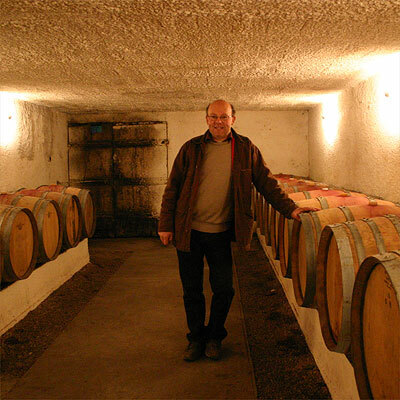 PHILIPPE PICHARD IN HIS CELLAR. His Varesnes and Trois Quartiers both have more structure and intensity, but more or less belong to the same league of wines. The barrel-aged l'Ancestral is different, somewhat more like a Bordeaux si vous voulez. Oak, darkness, power... a serious wine for on the dinner table. It comes from older vines from siliceous and clay soils. Anyway, according to Chinon-based courtier Charles Sydney Pichard belongs to the category of "Fastest-Improving Producers" (in Tom Stevenson's Wine Report 2009). I think I have nothing to add to that. I spent a year in Angers during university. It is a very lovely town and I hope you enjoyed your time there. 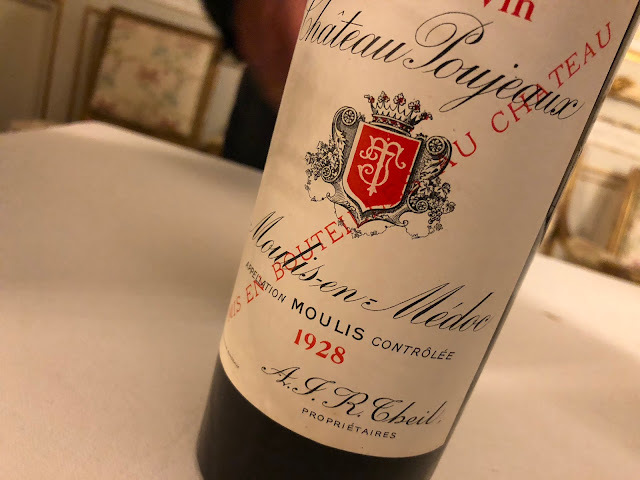 Even though I wasn't particularly "into" wine at the time, I did very much enjoy some of the C.F.-based wines of the region including some Anjou Villages-Brissac and Saumur-Champigny. They somehow seemed very "real" to me and are something that I continue to enjoy to this day. Yes we had a great time in Angers, and also in Saumur. I will write some more about this trip in another posting.